in 1987, but in 2011. I don't recall that white facade. Life seemed so busy on campus when I started university back in the fall of 1987. We never left campus, because activities were always going on. Heck, we never even left res except to go to class. About a month into the term, our fearless leader, Doug Armitage, said we should check out a movie. Another odd part about staying on campus all the time was that I did not know Edmonton at all, and feared I might get lost "in the city". I had no idea where I was going, and neither did most of the people around me. None of us were from Edmonton. That’s why we were all living in residence. However, there was a movie theatre nearby, within walking distance (we really didn’t have access to a car either really). We had passed it on our way to get Kentucky Fried Chicken a couple weeks earlier. It was called the Garneau Theatre, and was the sight of our first real road trip off campus – even if it was just a few blocks away. Again, places seem so much farther away when you don’t know where you’re going. The movie of choice: “Stakeout”. lobby of the Garneau Theatre in 1987. What was initially Doug and me, turned into a night on the town for all of us. It was a nice Saturday night in Edmonton. Not a drop of booze was drunk as we got ready and walked to the Garneau. Oddly, it was straight down 87th Avenue which ran in front of res. We walked past the Education building, where two guys were wrestling on the lawn, then the row of frat houses which looked lively. I do recall thinking they looked nothing like “Animal House” though. 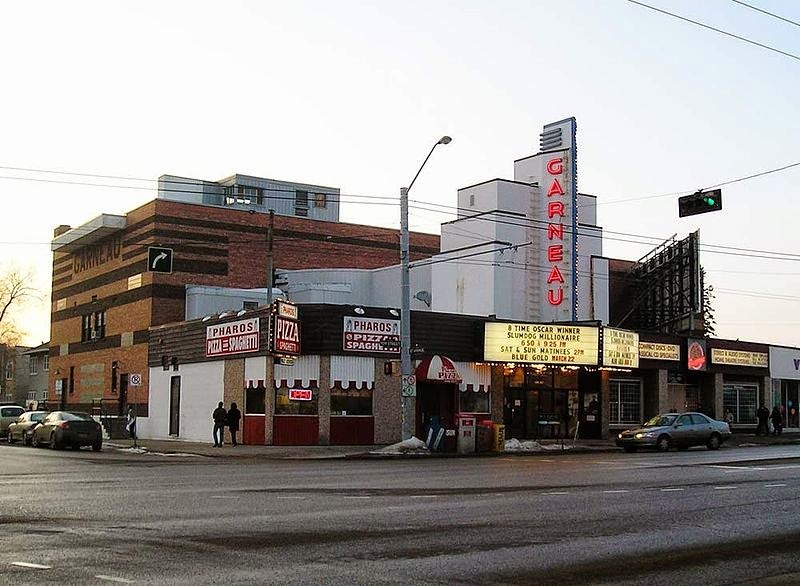 The Garneau Theatere was a red brick building that screamed character. It seemed much older to me than any of the theatres in Lethbridge, although it was smaller. “Stakeout” starred Richard Dreyfuss and Emilio Estevez as policemen on – well – a stakeout. Things take many unexpected turns, including Dreyfuss’ character falling in love with the woman they have under surveillance. The scene I always remember is Estevez watching the suspect, pulling the camera back and seeing Dreyfuss sitting across from her having a drink. He obviously knows Esevez is watching and not only smiles for the camera, but toasts Estevez. It was a Touchstone production, back when that studio was still new. It was an offshoot of Disney Studios, designed for movies that were, shall we say, less family-oriented. It was a good comedy, but then again I always like Richard Dreyfuss, and he had great chemistry with Emilio Estevez. They made a sequel a few years later, but life was too busy to ever take it in. It may seem strange to celebrate something as simple as going to see a movie. But it was a different time. Going to movies was still a treat for me, and there really is nothing like seeing a show on the big screen. I still feel that way. I would go on to see dozens, maybe a hundred, movies in Edmonton, in every theatre in every corner of the city. The experience never got old, and it all started at the venerable Garneau Theatre. The overriding feeling I had that night though, surrounded by all these new people I just met, was that I was home. I had found a new home.